What is a "Flat White"? Flat White is an espresso-based drink that originated in Australia and was perfected in New Zealand, and is currently spreading around the world at the hands of ex-patriot Kiwis and Aussies. There are several things about the "flat white" that would surprise an American used to Starbucks coffee. First is the rich and velvety texture of the flat white, making for an exceptionally pleasing drink in the mouth. The second surprise is the size of the drink, typically served in a 165 ml tulip-shaped cup, which is a mere 5 1/2 ounces! But quality matters over quantity, and this king of espresso-based drinks is not to be drowned in milk, but rather supported by the milk. 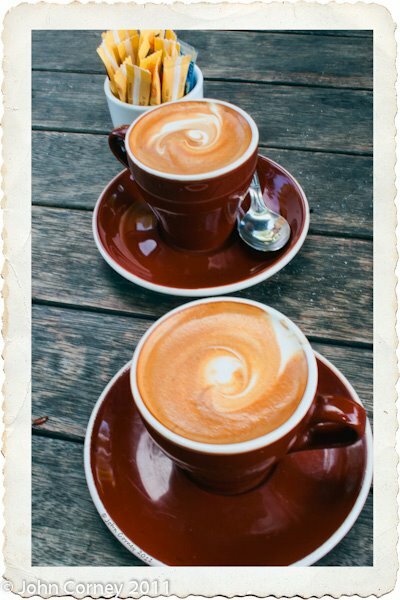 In helping you to understand what a flat white is, let's compare them to a couple of other espresso-based drinks that I'm sure you are aware of: the cappuccino and the caffe latte. Let's say the cappuccino is the "Marge Simpson" of espresso-based drinks, with the milk whipped into a bubbly froth and placed on top of the espresso like a high Marge Simpson "bee-hive" do. The latte, on the other hand, has had a hair cut, but nonetheless, has enough froth left in the milk to top the drink off with a slight bit of teasing on top. The flat white, on the other hand, doesn't have any of that volume on top, but rather has all that tease distributed throughout the espresso, giving it a rich, velvety feel texture, where the coffee dominates. Let's start out with the "ingredients" list. No substitutions allowed, otherwise it's not a flat white! fresh whole medium to light-roast coffee beans (throw away those beliefs that espresso is made with dark-roasted beans). If you are buying your beans from a West Coast U.S. roaster, they will often refer to light and medium roasts as "mid city" and "full city" roasts. Grind the beans to a fine espresso grind at the time of making your flat white. a heated 165 ml / 5.5 oz ceramic cup. "Tulip-shaped" is the standard, but if you haven't got any that shape, just make sure it's not a large cup, or restrict how much milk you add to the espresso if it is larger. Let's take it for granted that you've read all I've written here about making your espresso pull, rich with crema on top. So on to the milk. The milk for a flat white should not have any of the dry foam on top of it that is typical for making a caffe latte or cappuccino. The term used for what you do to the milk is "stretching". This is achieved by keeping the tip of the steaming wand slightly lower into the milk than usual so as not to break the surface of the milk at all. Your aim is not to introduce air into the milk. The heating of the milk and circulation of the milk in the pitcher will result in the milk becoming stretched. The volume should more than double in size and the milk should appear somewhat glassy and shiny when done. The milk should be heated to approximately 60° C / 140° F.
If you have a domestic machine that doesn't have a double-boiler, then an acceptable alternative is to use an aerolatte whisk, once again taking care not to break the surface of the milk, and if necessary folding the milk at the end. You can read all about this technique here: how to foam milk for your espresso-based drinks. If you have succeeded in making good stretched milk, there will be no dry foam on top. Pull your espresso shot in the later stages of your milk preparation or immediately after. Just before pouring hte milk into the espresso, bang the bottom of the pitcher onto a cloth on your counter top to break any air bubbles in the milk, and swirl the pitcher a couple of times. Finally gently pour the milk into the espresso so that the crema from the espresso floats on top of the milk. Voila! All going well you have made your first delicious flat white. Flat-White lends itself well to making what is referred to as Latte Art. I don't profess to be an expert at latte art, however, with a bit of practice you might be able to create patterns such as leaves and hearts as you will see on any flat white made in Australia or New Zealand, and in the better independent coffee shops in the U.S. But first of all just perfect making a great flat-white; it tastes just as good when well-made without any fancy art on top. Even without any latte art, the caramel-colored espresso crema floating on top of the drink is a work of art in itself! Now that I've wetted your appetite for a flat white, why not try making one at home. To get going you will initially need to make an investment in some appliances, so here are my recommendation for a home espresso maker and a coffee grinder. Never heard of a flat white but will definitely try to make one myself. I just love espresso and especially combinations with frothed milk. Thanks for your description. haven't heard it also in my country. do you know other terms of flat white? I've never heard of flat white either. Sounds definitely worth a try though! How does it turn out with flavor shots? No coffee snob in their right mind would add flavoring to any coffee, let alone a flat white. I also like flat a white and when it is made by a skilled barista it is fantastic but often it is more like a faulty Lattee. Also JonC I am with you no flavouring my shots of coffee. I disagree JohnC! You can be a bonified coffee snob and still get away with a few favour now and again! Good post. Looking forward to making one. Downplaying the milk in favor of the espresso really appeals to me. Thanks! Another recipe for a flat white is when you use more water to extract the espresso from the beans so the espresso volume is quite large - often filling 70-90% of the cup - depending on the clients' taste. Followed by milk with a dash of microfoam - if any microfoam at all! Some true flat white snobs will turn their noses up at the sight of microfoam on their flat white! Some prefer only a dash or staining of milk, much like that of the macchiato. It satisfies those hungering for a stronger, more dominant espresso flavour. A long black with milk if that is easier to visualize. I’m always glad to find new recipes to prepare coffee. Flat white didn’t try jet but now I will. Last new what I’ve tried was Cuban coffee. That was different taste and feelings too. I hope you enjoyed the blended ice-coffee, Matt. Great description! Flat white is something I have heard of but never tried...I will check it out ASAP! Thanks. I actually just ordered a "flat white" and due to the (lack of) skill on the part of the barista in my local star bucks, I got a Latte :( I think they need to up the level of training for some of these guys. You can also enjoy a flat white in South Africa - they're particularly common (and delicious) in Cape Town. Good to hear that flat whites are making their way around the planet. John, I had to make a comment and agree with you 100 percent.... no coffee snob should put flavoring in the coffee... PERIOD! I was in Australia/ New Zealand in May 2011. I'm not a gormet coffee drinker but I just spent $200 foe a coffee/cappucino maker so I can learn to make a "Flat White". Best coffee I've ever had. I felt the need to comment, even though this post was done years ago; just came across it the other day. Firstly, I'm from NZ and love me a flat white, plus I had no idea that flat whites weren't commonly made elsewhere, that's interesting. Secondly, I tried your recipe out, the coffee was delicious. And thirdly, I am all for adding a vanilla shot to my coffee if I'm feeling like something sweet and it still tastes great. Anywho, cheers for your recipe, it helped out alot :). Your Marge Simpson definition is perfect. Thanks, Peter. Appreciate the share. I learned about flat white while visiting New Zealand recently. It may bethe best way to prepare coffee there is. No flavors for me either. Well and good all these instructions, but what are the ratios of coffee and milk..... i would have thought this was the most important/critical instruction in the making of a cup of coffee???... apparently not!! A true flat-white should be made in a 165ml/5.5oz cup, which is what most people would consider a small cup. So once you extract a double-shot of espresso into the cup, fill the cup to the top with the milk. so thats what it's called i was steaming my milk this way for a while and loved it but was then told that i was making lattes wrong. Ha i knew there was a reason it was so good. Thanks for all the comments you left on various posts. I really appreciate your contributions and for taking time to read my posts. I worked in New Zealand and traveled in Australia and absolutely love a good flat white and can't find one in the U.S. that didn't turn out to be a latte. I have tried making one for the first time and was quite successful with your instructions. I look forward to making many more and perfecting the "stretched" milk technique. I love flat whites, never realised they would be so hard to get when I go overseas. Thank you for the instructions I will have to have a go at making them at home. I finally was able to try a real flat white on a recent trip to Sydney and LOVED IT. How can something made with same basic ingredients as a latte taste so much better?? But I have had no luck recreating it at home. Does anyone know of a place in the LA area where you can get a true flat white? Hi Brian, Glad to hear you got to try the real thing Downunder and loved it! Can someone explain to me the difference between a "cortado" and a "flat white"? Can someone explain to me the difference between a "cortado" and a "flat white" ? A cortado is similar or the same thing as a "macchiato". These drinks have very little milk foam added to them. Cortado is Spanish for "cut" (as you probably know), and "machiatto" is Italian for "stained". If you want to read more about macchiato, please see What is a macchiato. I have been in withdrawal for flat whites since leaving New Zealand a year ago! So glad that its something I should be able to make with my deLonghi. I've been having a daily Latte, but now, armed with a recipe and technique, I'll be a happy girl again. Kiwis are definitely proud of their coffers -as they should be. (I was just a temporary transplant.) But even their gas stations serve these beauties! Please try them. You won't be disappointed. Haven't heard about this before also. I love to try making this one at home. Making coffee with new recipe is just quite exciting. Anyways, I wanna share this handheld battery operated stainless steel Milk Frother which I always use in frothing milk and making delicious coffee. It's very easy to use and very helpful to me. I bought it from amazon http://amztk.com/milkfrother. I'm from New Zealand, living in Australia. I've always preferred using cream, not milk. Spent 10+ years in Melbourne, Aust and was always so frustrated at not being able to buy a standard carton of cream, since everything in the shops was "thickened cream". Flavourings = more chemicals/sugar, whereas the extra fat content from cream is actually good for you. Try it and see! This is so interesting! 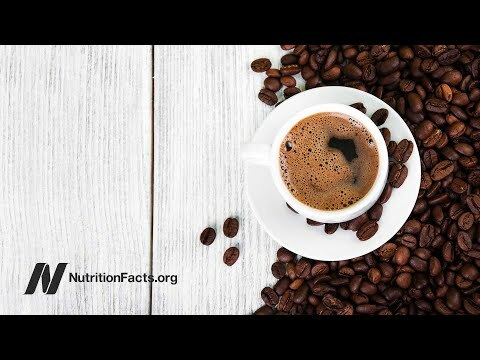 As a coffee lover, it's always nice to know a bit of history and background information about my favorite drink! Hey thanks for this blog, I really enjoyed all the articles. I'm a kiwi girl as well and love a good flat white. I have just started working at one of our local gas stations as a barista and have been struggling to understand the difference between the various types of coffee and how to make the specific types, and everyone tells me I'll get it as I do it more. But this has been really helpful and I feel really confident going into work tomorrow. Thanks so much!!! P.s. I'm with ya on the no flavor shots!! Just got into flat whites as a change from a capaccino - reason being I was fed up with so many bad 'capacinnos'. As someone commented previously, when a flat white is done correctly it's heaven, but unfortunately, here we go again .... as someone else commented,a lot of the time you end up with a dodgy latte! It's so infuriating - I thought barristas were trained. For the price you pay for a cup of coffee nowadays, I at least would like to receive what I actually order .... Is it too much to ask! Rant over - just off to make my own gorgeous cup of coffee. Hi Sue. Thanks for your post. And yes, it was the constant lack of skills on the part of baristas when I first moved to the U.S. that lead me to taking things into my own hands and just making my own espresso drinks at home. Hence this blog. Once when I ordered ordered a macchiato at a Peet's coffee the barista poured milk foam into the cup. I yelled "Stop! It's just meant to be a small dollop of foam." Her reply to me was "But it won't taste good". OMG! In her head she was making it for herself, not me. Anyhow, good luck out there.